Many people want to put their personal financial life in a box and separate that out from their spiritual life. From the way my Bible reads, I don't believe God thinks that way, though. Our personal finances are intertwined into our spiritual life. The primary reason for this: our finances are owned by Almighty God. They're not our finances to begin with. 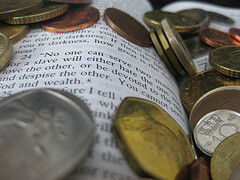 Spread throughout God's Word are "nuggets" of financial wisdom. It's been estimated that there are at least 800+ independent Bible passages directly related to handling God's money, God's way. Go, humble yourself, and importune your neighbor. And like a bird from the hand of the fowler (NASB). Here, we have a strong wisdom warning to avoid debt and other financial entanglements. The wording of this passage makes it very clear that indebtedness to others is a very unwise position to be in. Biblical, Godly wisdom says to get out of debt as quickly as possible! The writer of Proverbs uses the analogy of getting out of debt to a gazelle escaping from a hunter. If you've ever watched any of the National Geographic nature shows, you've probably seen the beautiful gazelle being hunted down by the lightening fast cheetah. In order to escape from its hunter, the gazelle needs to move super fast in a zig-zag fashion. Hopefully, through a lot of hard work and "strategery," the gazelle can get away. 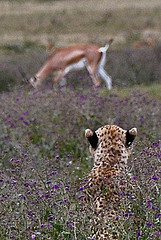 In the same way, those of us who are in debt would be wise to follow the example of the gazelle. If we want to escape, then we're going to have to "bust it." We're going to need to move strategically and as fast as possible to escape the crushing hardship that debt can be in our lives. How Are You Handling Your Finances? So, how are you handling your finances? Are you using the wisdom of Proverbs? Are you "busting it" with gazelle intensity to get out of debt as quickly as possible? If you aren't, what changes do you need to make in your personal finances? Who do you need to go see for some help? What program(s) do you need to look into to learn how to get a handle on your finances as quickly as possible? Our current economy is not getting better. Now is the time to get going. Don't delay! Lord, Have I Been A Good Manager For You? How To Enjoy A Guilt Free Good Life!